OEM stripes on GT cars?? Does anyone have them? correct me if I'm wrong but there were OEM vinyl stripes that could be ordered on GTs. Is that right? If so, I don't think I have ever seen them. Does anyone have them? How do they look? How are they holding up? Were they installed at the dealership or at the factory? 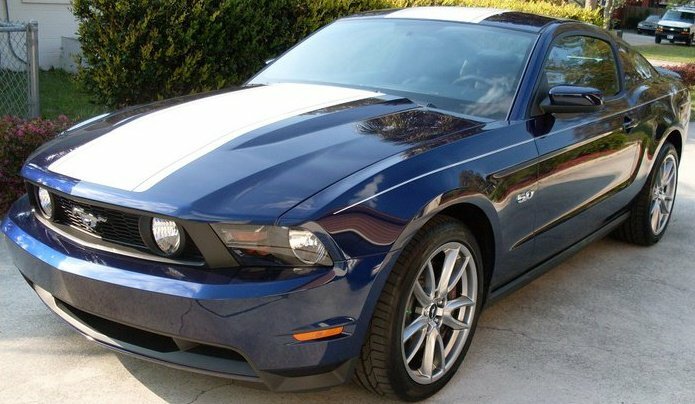 My 2013 GT has the Over The Top stripes, which I ordered and they were installed at the factory. They are holding up great. But then my stang spends most of its time in a garage. Last edited by SoFlaBoss; 4/23/14 at 01:00 PM. i have oem super snake stripe.. actually they show up in the window sticker but they are installed at the dealership and they use third party vinyl installers to install it who use their own product.. this is what happened in my case... 1 yr now no issue though. Mine were installed at the factory. 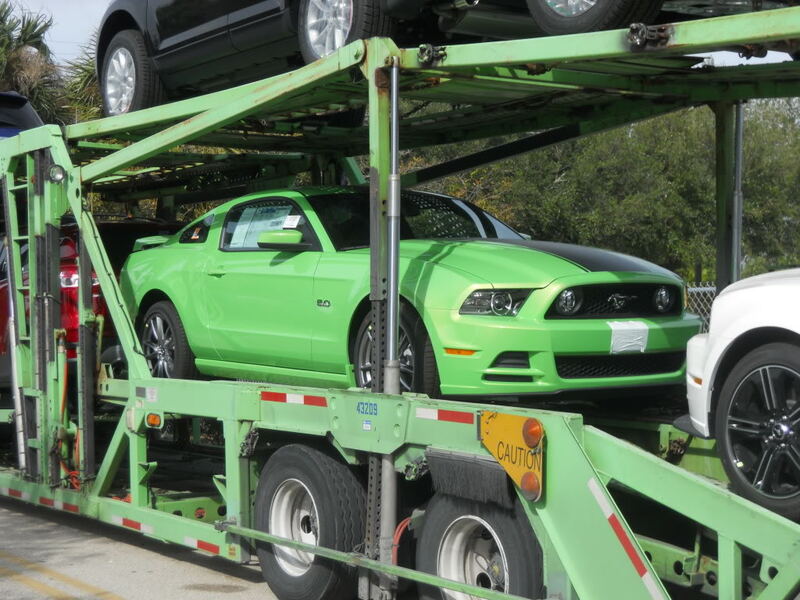 Here they are when my stang arrived in So. Florida. My 2011 came with factory OTT stripes. It's vinyl and they are holding up great. It's a daily driver with 25k miles. It's garage kept but it sits out in the sun every day. The dealership put crappy painted on pin stripes which have since been removed. 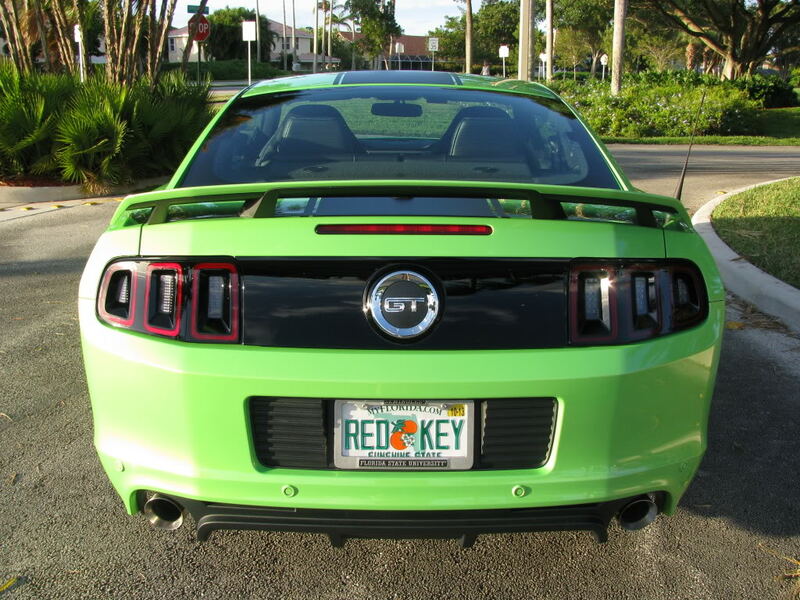 My 2013 GT has the Over The Top stripes, which I ordered and they were installed at the factory. They are holding up great. 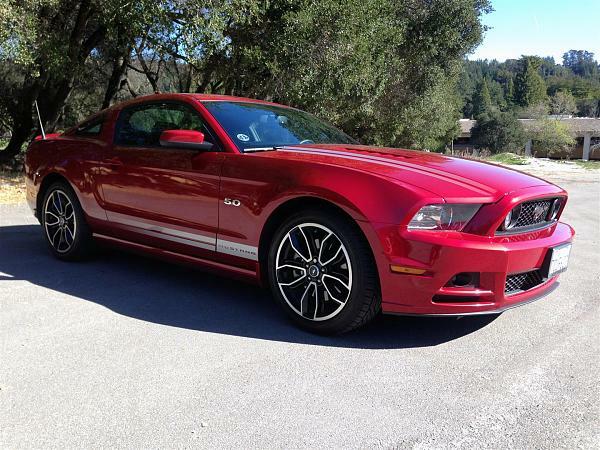 But then my stang spends most of its time in a garage. The OTT stripes weren't available on the 11-12 MY. 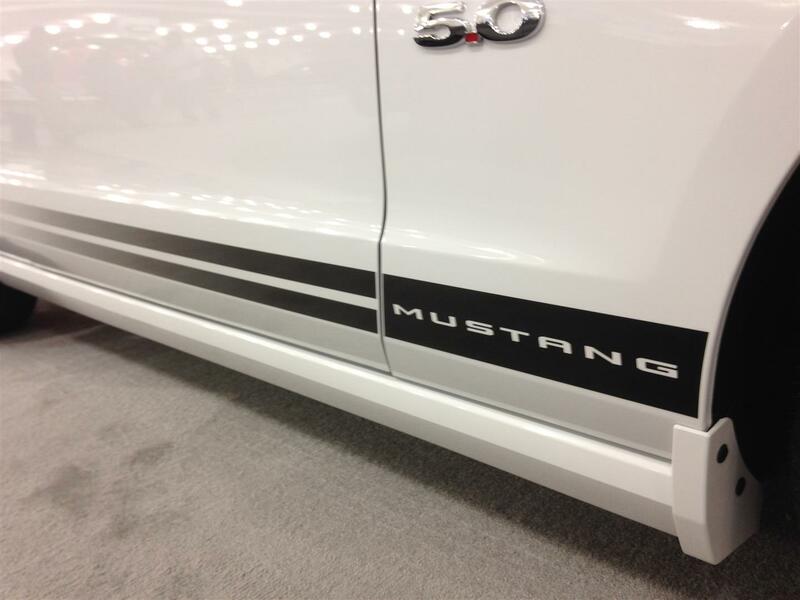 However, there were other stripe options from the factory for yours. I stand corrected! Yours is the first of the 11-12 MY I've seen with the OTT Racing Stripe. Cool! I even bought a 2011 and a 2012. 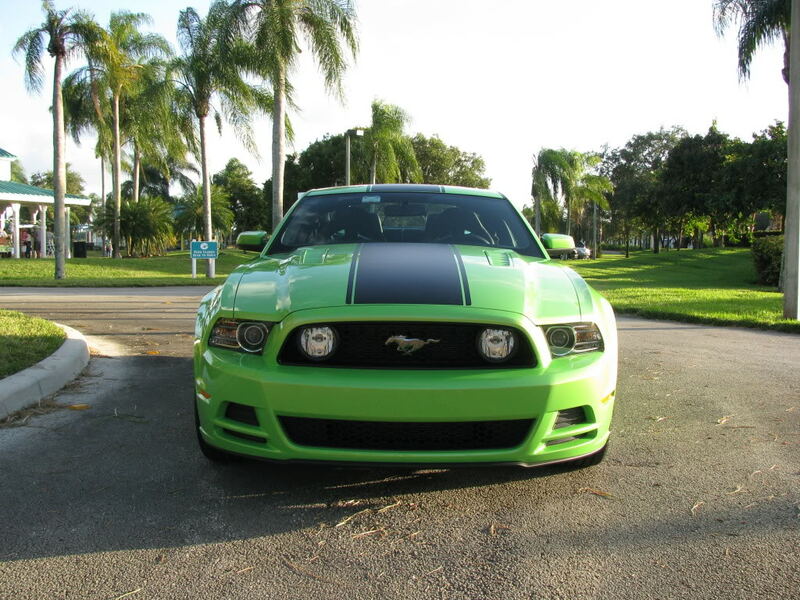 However, they were a V6 MCA Package and a Boss 302, so a different stripe on either one wasn't an option. My '11 GT/CS came with door fadeout stripes, kinda subtle and yeah, love them. they balance the sides perfectly.... been on since I bought it in October 2010 and holding up just fine! They're also model specific to the GT/CS so I did not want to alter the original overall look FORD deemed as OEM equipment for these CS! this confuses me.. your stripes are def. not OEM. I have the 2013 OEM Appearance Pack decals on my car #DR3Z-6320000-DAF Silver Stripe Kit from Ford. Last edited by 13Stang; 4/18/14 at 09:30 AM. I thought that was a 2014 option? In 2013 there was no appearance pack available, was there? 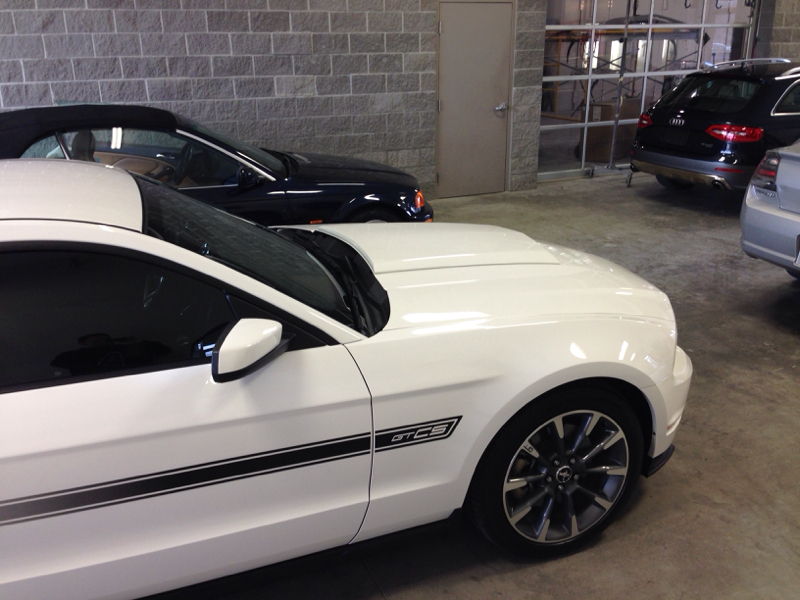 I rented a new 2013 sterling silver GT last year and it had the same over the top stripe in black. No way Hertz installed aftermarket stripes on a rental car. My '11 GT/CS came with door fadeout stripes, kinda subtle and yeah, love them. they balance the sides perfectly.... been on since I bought it in October 2010 and holding up just fine! They're also model specific to the GT/CS so I did not want to alter the original overall look FORD deemed as OEM equipment for these CS! Agreed. 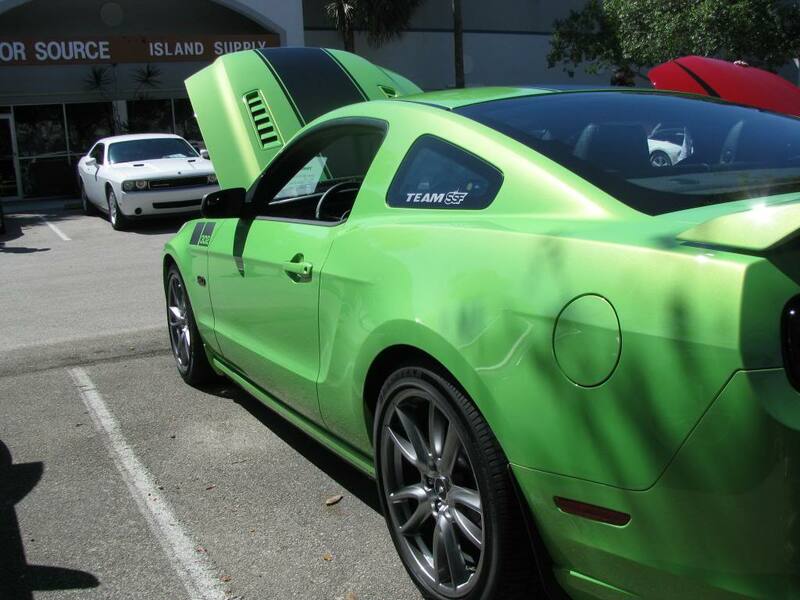 That stripe looks awesome on any GTCS color. It sold me in person. My window sticker says "tape stripe delete" on it. What style of stripe does this refer to? I wouldn't do factory stripes. They never go bumper to bumper unless it's a Shelby. They also charge about $400 which is the same price any decal shop would charge for installation and you can get exactly what you want. I'm thinking of striping my car when I get it. Is there any worry about uneven paint wear? I assume current clear coats block uv pretty well so in a few years if I get tired of them or want to change them the paint should be fine. I hear you on this...but there's something inherently cool about a factory option where a custom stripe can come across as a bit too much. Personal taste...but it's easy to cross over into "ricer" territory if you over do it. Yes. As far as I know, If your car gets a lot of weather exposure, the paint under the vinyl will always age differently. It might not be as noticable as it was on older cars with less fade resistant finishes but I suspect you'll still be able to see where the stripes "were" when you remove them. It's probably worth the risk though. Just keep your whole car clean and waxed...and I suspect that you could have it compounded when the stripes come off to minimize the artifacts if necessary. Hopefully someone with more specific experience can lend their opinion. Thanks! I'm also wondering about how you deal with waxing the car. I would assume wax on the stripes might not look so great. Seems like a pain if that's the case. Quick Reply: OEM stripes on GT cars?? Does anyone have them?